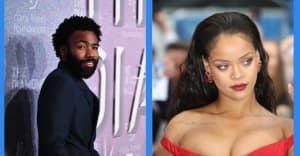 On Sunday, a tweet went viral that said Rihanna was starting a wine and spirits company, which naturally made a lot of people excited. The screenshots in the tweet are from a trademarked that was filed on August 10 in Delaware for a "distilled spirits" brand called "Fenty Estates Wine And Spirits Company." Lots of people immediately assumed the artist was behind this new brand that has her last name in the title. But the spirits brand trademark was filed by JGC Global LLC and not Rihanna's Roraj Trade LLC, which owns the trademark on Rihanna's name and Fenty Beauty. It's likely just another Fenty and not Rihanna who registered the name (although we all know there is only one true Fenty and that's Robyn "Rihanna" Fenty). A source close to Rihanna confirmed to The FADER that reports of the alcohol brand are "totally untrue." A legal representative for JGC Global LLC did not immediately return a request for comment.